Are you ready for tomorrow’s tweetout? Here’s our guest list for the live tweet. We hope you join us! As usual, the tweetout starts at 9/8c and continues all through the episode. Episode airs on August 27, 2015. Can’t wait to see what will happen! Time for another Dominion Weekly Round up! Episode 2×07 aired five days ago. Did you like it? As usual, it’d be great if you could add your user rating on IMDb and com, and also complete the SpoilerTV poll. Updates on the official Syfy website:‘Inside Dominion’ for episode 2×07 (alternative link: Hulu), photo recap for episode 2×07, promo for episode 2×08 (alternative link: YouTube), (alternative links: Hulu – Dailymotion), more recap videos from episode 2×07 in the video section. Dominion: Revelations has chapter VII now activated. It covers an angel’s guide to New Delphi. Last but not least we will be live tweeting with the cast again for episode 2×08. More information to follow. Thanks again for supporting the show! Calling all Dominion fans! Here’s a chance to win a Dominion T-shirt. 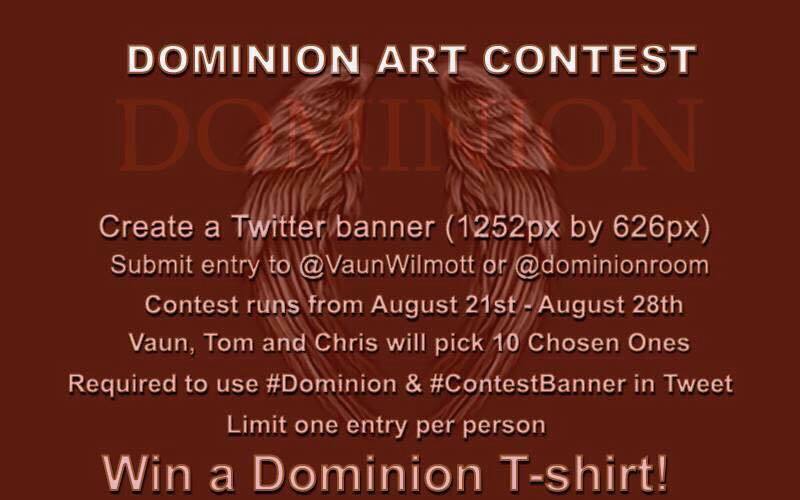 Create a Twitter banner using Dominion art 1252 px x 626 px and submit to @VaunWilmott or @dominionroom. Contest runs from August 21, 2015- August 28, 2015. Vaun, Tom Wisdom and Chris Egan will pick 10 Chosen Ones . 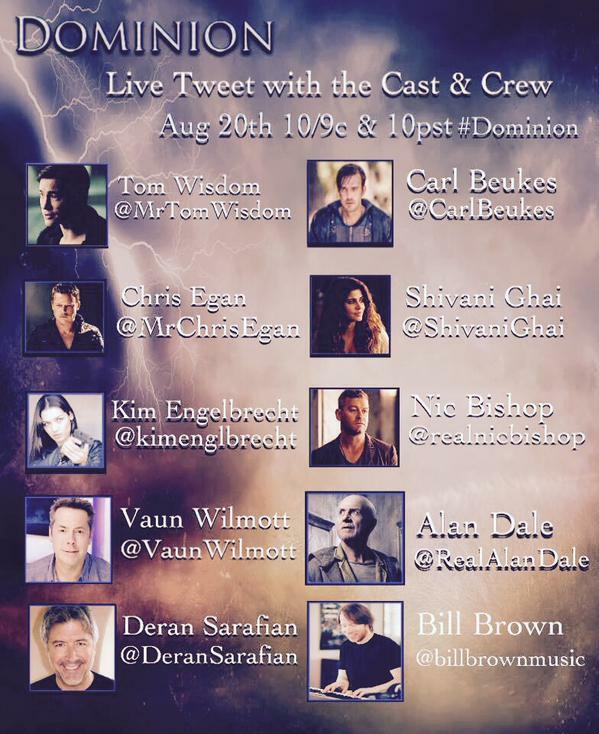 Entry must contain the #Dominion and #ContestBanner hashtags in the tweet. Good luck! Can’t wait to see all the amazing artwork from the fans! Are you ready for tonight’s tweetout? Here’s our guest list for the live tweet. We hope you join us! As usual, the tweetout starts at 9/8c and continues all through the episode. 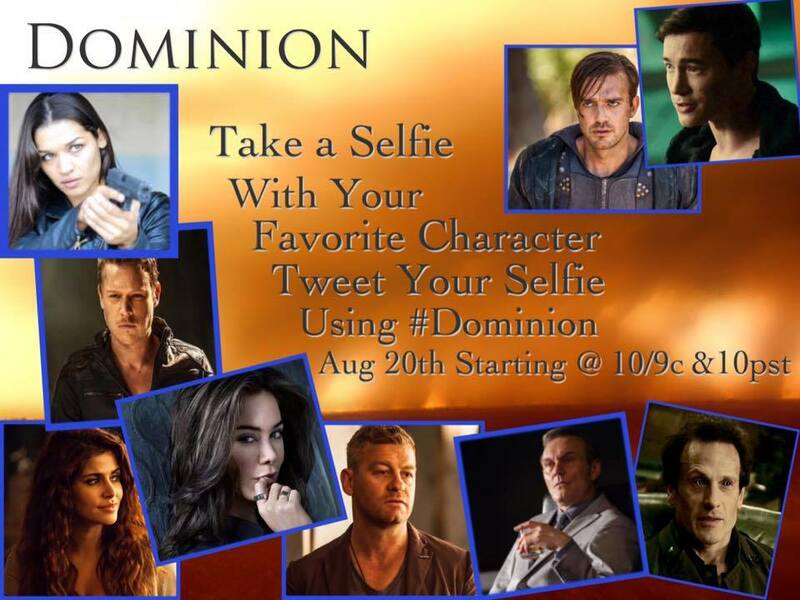 Fans are also invited to take a selfie with their favorite Dominion character and post on twitter using the #dominion hashtag: Huge thanks to Laura L for the graphic! Season 2 of Dominion makes it to UK and Irish TV screens today! Syfy UK will premiere season 2 tonight at 9 PM UK time. We will be live tweeting during the show, and some of the cast has also confirmed they will be there (namely Anthony Head, Shivani Ghai, Luke Allen-Gale, Christina Chong, and possibly more). The episode/live tweet starts at 9 PM local time, which translates to 4 PM Eastern, 1 PM Pacific and 10 PM Central Europe. 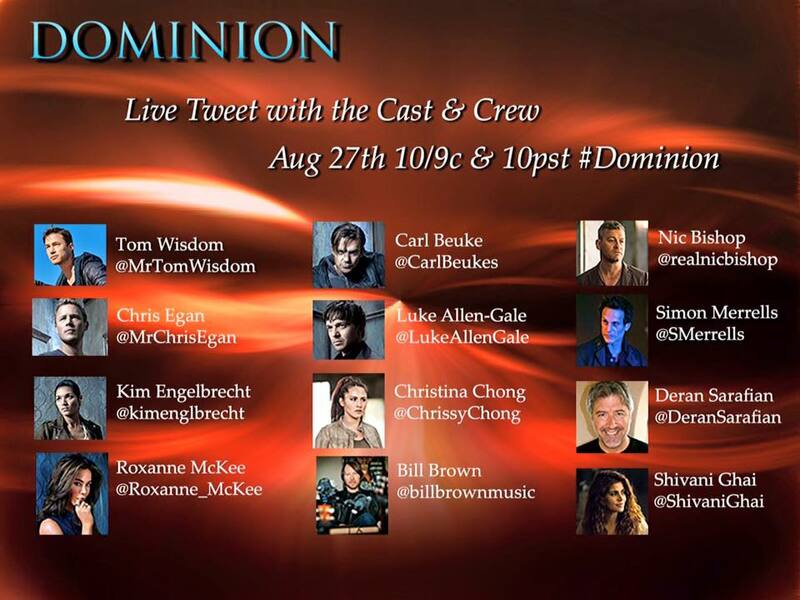 Come join us for all the fun, and don’t forget the #Dominion hashtag when you tweet! 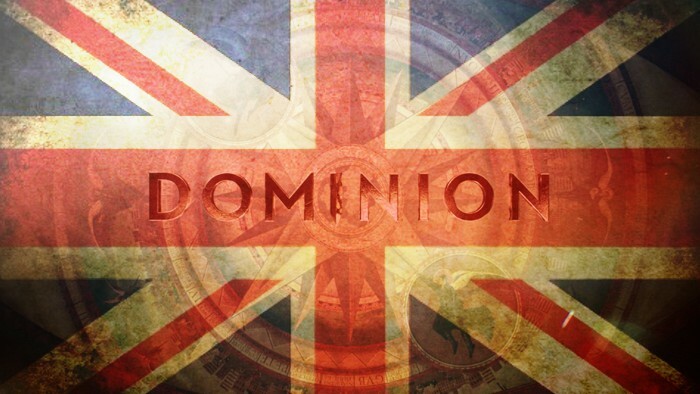 As of today, the Dominion fans in the UK can breathe easier because unlike season 1, they will be able to see season 2 almost at the same time as the US. The UK premiere date for season 2 was announced today as July 15, 2015 (9 PM), which is barely a week behind the US. Dominion‘s second season will start airing on Syfy in the US on July 9, in Canada on Showcase on July 12 and in Great Britain on Syfy UK on July 15.